Ad Logger for WordPress is a new plugin for logging clicks on iframe adverts and other social network buttons. At the moment it can log Google AdSense / Amazon Associates adverts, and Facebook, Twitter and Google +1 social media buttons. It also has a ‘catch-all’ mode which will log any other iframe clicks. Clicks stats in one place – You can get statistics for all these services individually but Ad Logger allows you to see all the clicks in one place. It will however give you different number; Ad Logger counts raw clicks, whereas your ad/social media provider will count valid clicks. Raw click logs – With Ad Logger you can see the raw logs which will give you information that your ad/social media provider probably won’t allow you to see such as IP address, page referrer, and browser agent. Reports – Ad Logger has an AJAX UI to allow you to move through the results easily. As well as seeing the log you can view reports showing the which browser, referrer, page, IP most of your clicks come from. And you can filter the results to show all the logs for a specific IP, page, iframe type, etc by clicking on the type icon, or the ⇓ arrows. Click bombing protection – As it has access to the raw click logs Ad Logger can help you to combat intentional or accidental AdSense ‘click bombing’ by disabling adverts if too many clicks are registered. It can disable ads that you may have inserted using the Ad Injection plugin, or by dynamically hiding the div that you have put the adverts into. Here is the main UI, from top to bottom you can see the yellow message bar which I use to highlight the latest updates, then the navigation buttons. To the right of the navigation buttons are the report links. 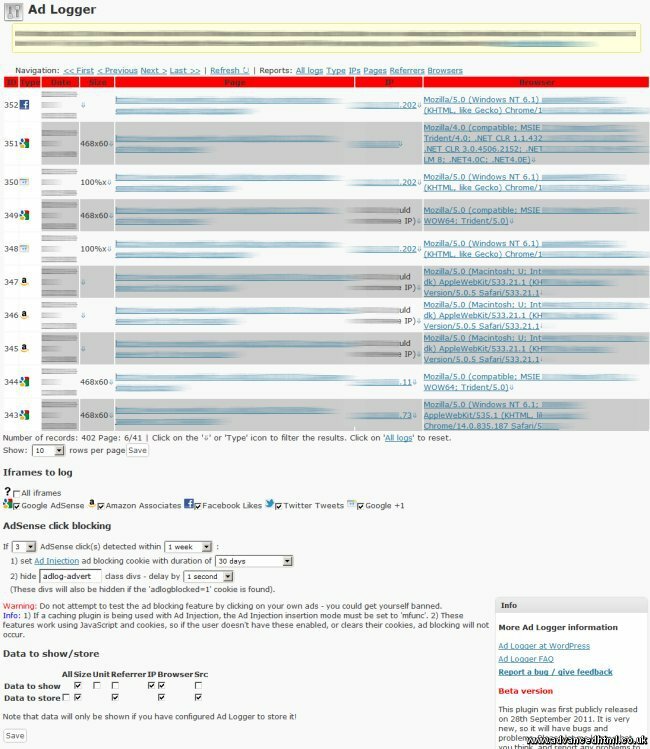 Next is the main log table – you can see it combines clicks from AdSense, Amazon Associates, Facebook, Twitter and Google +1. You can click on the type icon or the ⇓ arrows to filter your results. Under the table you can set how many rows are shown at once. Next are the boxes to select which iframes are logged. Then the optional click blocking preferences. Finally you can configure what information is shown in the log table, and what information gets stored to the database. 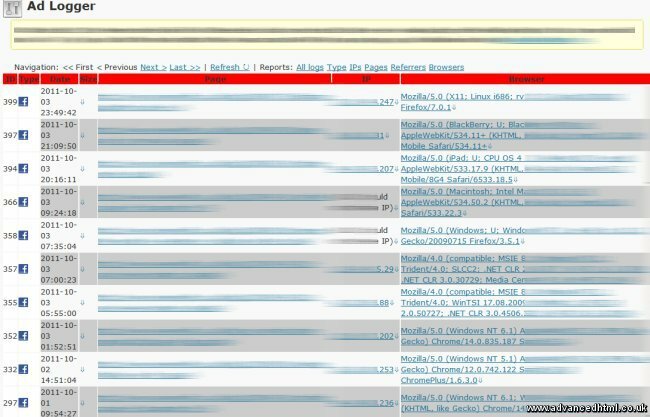 This is the type report and shows how many clicks occurred on each type of iframe. Here you can see that there were 27 clicks on Facebook like buttons, and 5 on Google +1. By clicking on any of the ‘type’ icons you can filter your results to just that type. Here I clicked on the Facebook icon and so am just seeing Facebook button clicks. Ad Logger does not modify your original ad code, so hopefully won’t break your ad provider’s TOS. I can’t however guarantee this, so you have to make a judgement call as to whether you think it is safe for you to use. Results are stored in a new table in your WordPress database. This table can be cleared of data at any time, and it will be automatically deleted if you uninstall the plugin. The plugin limits the size of the table to 100,000 rows (this will be configurable in a later release). If you have configured click blocking then Ad Logger will use a cookie to count how many clicks have occurred. If the limit is reached then Ad Logger can then set another cookie which will prevent Ad Injection’s ads from being added to new pages, and/or it can remove the div containing the ads from the current page. Nothing! £0, $0! You are however welcome to make a donation via the plugin UI if you find it useful. I have spent several hundred hours of my own time producing this plugin, which I have now released under a GPLv2 licence. How do I install Ad Logger? Ad Logger is available for free from the WordPress plugin repository. The easiest way to install it by searching for ‘Ad Logger’ from the ‘Add New’ link in the ‘Plugins’ section of the WordPress UI. Future planned features include being able to block adverts by IP address (which will work either standalone with Ad Logger, or in conjunction with Ad Injection), more awareness of other iframe types, and possibly the ability to log non-iframe events. E.g. other advertising/affiliate link clicks. Ad Injection (the plugin for injecting adverts into your WordPress blog) version 1.2.0.0 should be out in a week or two (mid-September 2011). Here is a preview of some of the new features – the screen shots are from the unreleased version so the UI may change slightly before release. 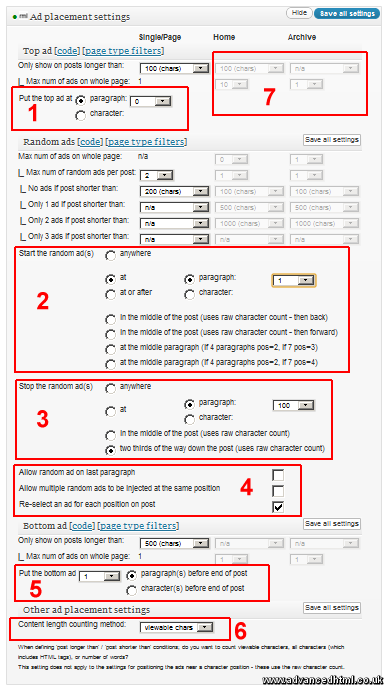 Ad Injection already has many options for selecting exactly how the top, random and bottom ads are positioned. But some people need more control, so 1.2.0.0 will have a load of new features. With 1.2.0.0 it will be possible to have the top ad start at a position other than at the very top. You will be able to choose a paragraph for it to start, or a character position. If you choose a character position the ad will appear at the next paragraph after your chosen character. The character count is based on the raw number of characters in the content (which includes HTML tags). Ad Injection has had the option to select which paragraph the random ads start at for a long time. Recently I added options to start the ads ‘at or after’ a paragraph/character position as well. The new 1.2.0.0 will have options to start the ads from the middle of the post – particularly useful if you like a top, middle and a bottom advert. There are several different methods by which the middle position can be calculated. A brand new feature is to set a position to stop the random adverts. You can stop the adverts by paragraph/character count, in the middle of the post, or two thirds of the way down the post. These options were previously hidden away on the Ad Rotation tab. They all affect the ad placement settings so it made more sense to move them here. The bottom ad no longer has to be right at the bottom of the post. If you want it at the last-but-one paragraph, you’ll be able to do that. Another setting relevant to this section that was previously hidden away where you probably wouldn’t spot it. Instead of disappearing when you exclude all the home or archive ads, these sections will now fade away. This (I hope) makes it obvious that the options do exist, but that they are disabled. I had been having intermittent reports that parts of the UI were not drawing on some blogs. I found out that this was caused on blogs that had large numbers of tags, but very little memory. The old Ad Injection would load all the tags at once (which on some blogs could be thousands). A recent update to Ad Injection includes an update to load the tags in batches of 100, and the new 1.2.0.0 version will move the filters section futher down the screen, so if you do run out of memory you will (hopefully) still be able to use the most useful parts of the UI. You can see in this screenshot the tick boxes which will become transparent instead of invisible in Ad Injection 1.2.0.0. And on the right I’ve added the ‘days older than’ settings information to the summary. These are important settings so I think it makes sense to have the information easily visible. This update will include major changes to the part of the code that does the insertion of advert into your post content. As such it may contain new bugs – but don’t worry I usually get bugs fixed pretty soon after they are reported. If you want to beta test the 1.2.0.0 version contact me via the feedback form in Ad Injection, or via this website. If you have any comments on the soon to be released Ad Injection 1.2.0.0 please do get in touch. You can download Ad Injection from the WordPress site, or from your blog by searching for ‘Ad Injection’. Many blogs have a list of related articles after each of their posts. I wanted something similar for my WordPress blog but found it wasn’t as easy to do as I thought it would be. At the same time I was interested in capturing any access attempts to non-existent pages (causing a 404 error), and showing a list of suggested links. This is something that is useful to do to turn people who get 404 errors into readers of your blog. I first looked at the WASABI related post plugin. It did what I wanted with the related entries but it requires you to add a tag to each post where you want the related entries to appear. There is also a version of the plugin which can generate sensible links for any 404 errors. It does this by turning the incorrect URL into a list of terms which are then used to find related posts. The next plugin that I read about was called ‘Aizattos Related Posts’. This plugin was originally based on WASABI but has evolved since. It inserts related links without needed to add any special tags to the posts. A lot of good feedback was given about this plugin but it seems that the author has removed it from the original download site. Fortunately someone has re-posted this plugin to this site. I therefore have what I need in two separate plugins. I installed the Aizattos Related Posts plugins and then created a modified version of the WASABI 404 handling code. The 404 handler is in one function ‘related_posts_404’. Below is the modified version of the WASABI code which will work with the Aizattos Related Posts plugin. As well as showing the related links it also shows an extract from the post page. Just put this function in the Aizattos Related Posts plugin PHP file. $sql = "SELECT ID, post_title, post_content,"
. "MATCH (post_name, post_content) "
. "AGAINST ('$terms') AS score "
. "FROM $wpdb->posts WHERE "
. "AND post_date <= '$now' "
Although no code modifications are needed for the related links in your normal posts, you will have to make a modification to your theme’s 404 page if you want related links for any ‘Not Found’ errors. In blue below is the modification I made to my 404.php for the default theme.